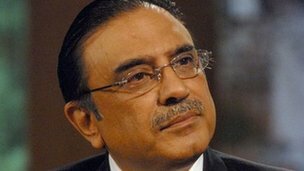 Pakistan's President Asif Ali Zardari will meet Prime Minister Manmohan Singh in the Indian capital, Delhi, on 8 April, his office has announced. Mr Zardari will visit, in a private capacity, the shrine of a famous Sufi Muslim saint, in north-west Rajasthan state, his spokesman said. He will meet Mr Singh for lunch before visiting the shrine in Ajmer city. This will be the first visit to India by a Pakistani head of state for seven years. The visit comes as tensions ease between the nuclear-armed neighbours amid efforts to improve mutual trade over the last few months, correspondents say. Late on Sunday night, Pakistani presidential spokesman Farhatullah Babar said Mr Zardari had accepted Mr Singh's invitation for lunch and would stop by in Delhi on way to Ajmer, the Times of India reports. Reports from Ajmer said the administration was preparing for Mr Zardari's visit and that the entire shrine area was expected to be closed to other devotees during the Pakistani president's visit. Earlier on Sunday, the presidential office said that an India visit was on the cards and the date and details of the trip were being worked out. This would be Mr Zardari's first visit to India since he took over as president in 2008. The last Pakistani president to visit India was Gen Pervez Musharraf, who came on an official visit in 2005. Dialogue between India and Pakistan is being strongly encouraged by the United States in particular, as it is keen to promote regional stability ahead of the withdrawal of Nato-led forces in Afghanistan, correspondents say.